JOHN MURPHY and LOUISE MURPHY vs. ALBERT BARNES and BETTY BARNES. The plaintiffs, John and Louise Murphy, are the owners of the premises at 34 Abbotsford Street in Boston, in the County of Suffolk, shown as Lot 28F on a plan dated March 23, 1895 by Charles H. W. Wood, Surveyors (Exhipit No. 3). A copy of said plan is attached hereto as Appendix A. 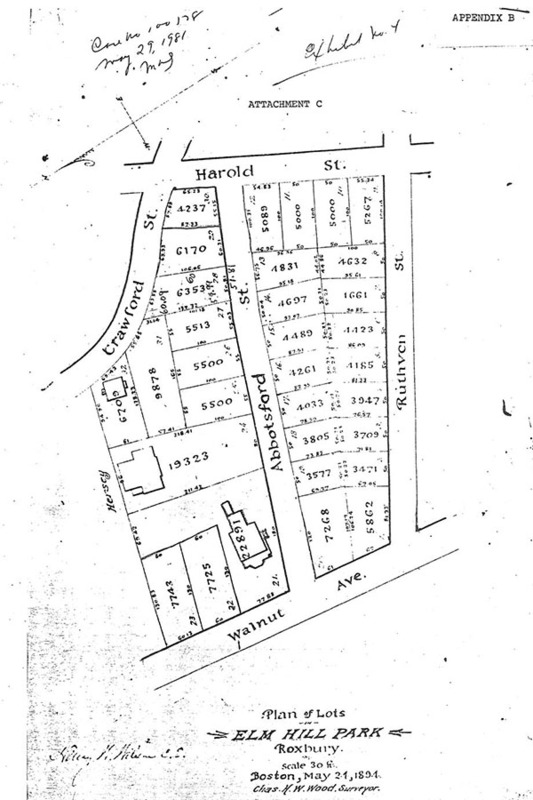 The plaintiffs also own an additional strip of land one foot in width comprising a part of Lot 27 as shown on an earlier plan by Wood dated May 21, 1894 (Exhibit No. 4) which is attached hereto as Appendix B. The defendants, Albert and Betty Barnes, own the remainder of said Lot 27, which is now known and numbered as 30 Abbotsford Street. The plaintiffs acquired title from his parents by deed dated January 30, 1964 and recorded with Suffolk Deeds, Book 7821, Page 77 (Exhibit No. 1), and the defendants purchased their property late in the following year from Drina S. Braithwaite, et al, by deed dated October 25, 1965 and duly recorded in Book 7994, Page 371 (Exhibit No. 2). The plaintiffs now complain that a driveway on the defendants' property extends onto theirs and that a fence erected by the defendants is situated on the plaintiffs' land. The plaintiffs seek the removal of the fence and the recovery of two thousand dollars in damages. The defendants in their answer contend that the driveway and fence have been in their present location for countless years and that the defendants have only repaired the existing driveway and fence. A trial was held at the Land Court on May 29, 1981 at which the four parties testified. The two deeds, the two plans, the surveyor's field notes (Exhibit No. 5) and five photographs comprising Exhibit No. 6 were introduced without objection as Exhibits and are incorporated herein by reference for the purpose of any appeal. On all the evidence, I find and rule as follows: the plaintiffs and the defendants own adjoining properties on Abbotsford Street in the Roxbury District of Boston; they have been neighbors for many years, the plaintiffs having taken title to their property in early 1964 and the defendants in 1965; apparently difficulties arose between them in 1979 which led the plaintiffs to have the front and side lines of their property surveyed; the cross cuts made by the surveyor and circled in yellow by him, show the defendants' fence and a portion of the driveway to be located on the land to which the plaintiffs have record title; [Note 1] after the field work by the surveyor was completed, about June 30, 1979, the plaintiffs complained to the defendants about the location of the fence, to which they had not previously objected; they contend that they had not realized until the survey that it was on their land; the present complaint was filed in September of 1980; the parties agree that the driveway was paved about 1964 and the present fence built about 1970; some of the improvements to the properties stemmed from the presence of the Boston Redevelopment Authority's Washington Park Renewal project; the fence originally was erected by the defendants, after consulting the plaintiffs; and the evidence was inconclusive as to whether there formerly had been a small fence in the same location. As set forth above, the premises now owned by the plaintiffs originally were shown as Lot 28F on Exhibit No. 3. At some time, however, and the record is silent as to when, a one foot wide strip was added to the plaintiffs' property from the original Lot 27. Although the surveyor did not testify at the trial, his work was introduced without objection. The surveyor's field notes (Exhibit No. 5) state that the one foot wide strip was not staked. 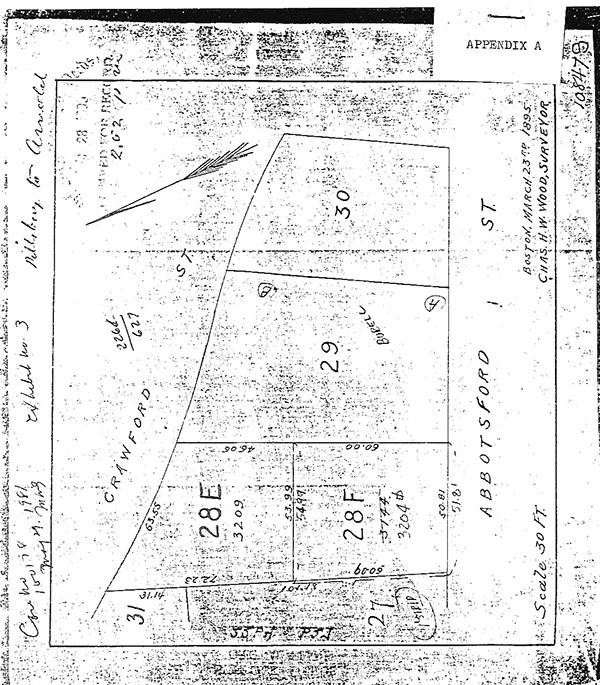 In addition, a careful study of the notes leads to the conclusion that the cross cuts which appear in the photographs and are noted on his field notes, were placed on the northwesterly line of Lot 28F and that the property line is one foot northwesterly thereof. This conclusion ties in with Mr. Murphy's testimony as to the previous clearance of approximately four feet between his building and the property line. While it would have been helpul to the Court to have the surveyor testify as to the steps he followed in recapturing the boundary line, I find and rule that his field notes are sufficient and that the plaintiffs have borne their burden of establishing the location of the line. This being so, it is apparent that the fence is located on the land of the plaintiffs. There is nothing in the record to show that the defendants have a right to keep it there. Mrs.Barnes' own testimony was to the effect that she sought the permission of Mr. Murphy for the construction of the present fence. It was not clear whether there previously had been a fence in the same location, and I find that there was not; even if there had been, there was no proof as to when and under what circumstances it had been erected. Since the origin of the present fence was permissive, either expressly or with silent acquiesence, there is nothing to prevent the plaintiffs from now revoking the permission and requesting the defendants to move the fence to the property line. The plaintiffs introduced no evidence as to damages suffered by them, and I find that there were none. I, therefore, find and rule on all the evidence, that the fence erected by the defendants is on the land of the plaintiffs; that it was so erected with the consent or silent acquiesence of the plaintiffs; that the consent has now been revoked; that there is no question of prescription or adverse possession in the case; no convincing evidence of a previous fence, its origin, history, location or the like having been introduced; that the fence must be removed, either completely or at least to the property line between the parties within sixty (60) days from the date hereof, subject to the vicissitidues of the winter weather, and that the plaintiffs are not entitled to damages. [Note 1] The angle of the "sticks" which appear in Exhibit No. 6, photographs I and II suggest that they were used to mark the cross cut for the camera and technically not to serve as stakes.